A "squid-type" underwater robot developed by Osaka University in Japan was demonstrated in a Kobe swimming pool on October 21st as part of an underwater robot festival. Although they refer to this as a "squid-type" robot; it does not propel itself by shooting jets of water backward. It moves and maneuvers itself in an unmistakably biomimetic (animal-mimic) way, though. It uses rubber panels on the sides to "fly" in a manner more similar to skates and stingrays, curling them rhythmically for forward thrust. It has been designed with a flat body to easily enter narrow spaces. There are some species of squid that have similar movements to their flukes or tails (see photo below). In addition to the precise control technologies needed to move robots in water and the systems to maintain their attitude in extremely unstable currents, brand new propulsion systems are being imagined for robots being designed to monitor ocean environments, search out underwater resources as well as perform other underwater missions. Sure, they've got robotic lobsters, elephant trunks and even big dogs. But what about robotic lamprey parasites? Cool robo-turtle executes complex maneuvers effortlessly due to its flipper controls. Also, fans of science fiction writer Murray Leinster might remember the Wabbler autonomous underwater robot from his 1942 short story of the same name. 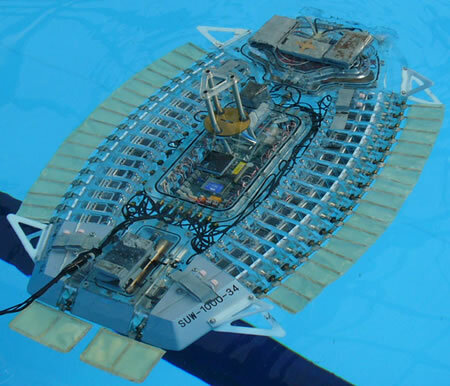 Read a bit more about the squid-type underwater robot. See more squid underwater robot pictures.